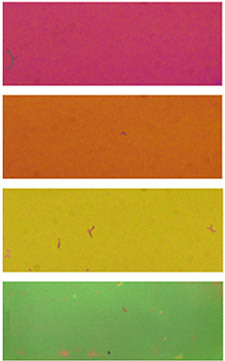 A wide range of pure colors created by nanoscale arrangement of synthetic melanin. Inspired by the way iridescent bird feathers play with light, scientists have created thin films of material in a wide range of pure colors — from red to green — with hues determined by physical structure rather than pigments. 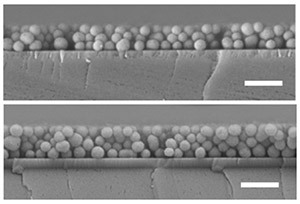 Thin films of synthetic melanin nanoparticles. Hue varies with the thickness and packing density of the particles. Gianneschi’s work focuses on nanoparticles that can sense and respond to the environment. He proposed the project after hearing Matthew Shawkey, a biology professor at the University of Akron, describe his work on the structural color in bird feathers at a conference. Gianneschi, Shawkey and colleagues at both universities report the fruits of the resulting collaboration in the journal ACS Nano, posted online May 12. To mimic natural melanosomes, Yiwen Li, a postdoctoral fellow in Gianneschi’s lab, chemically linked a similar molecule, dopamine, into meshes. The linked, or polydopamine, balled up into spherical particles of near uniform size. Ming Xiao, a graduate student who works with Shawkey and polymer science professor Ali Dhinojwala at the University of Akron, dried different concentrations of the particles to form thin films of tightly packed polydopamine particles. The films reflect pure colors of light; red, orange, yellow and green, with hue determined by the thickness of the polydopamine layer and how tightly the particles packed, which relates to their size, analysis by Shawkey’s group determined. The colors are exceptionally uniform across the films, according to precise measurements by Dimitri Deheyn, a research scientist at UC San Diego’s Scripps Institution of Oceanography who studies how a wide variety of organisms use light and color to communicate. “This spatial mapping of spectra also tells you about color changes associated with changes in the size or depth of the particles,” Deheyn said. Scanning electron micrographs of films made from nanoparticles of polydopamine seen in cross section. The top film produced a red hue, the bottom green. The qualities of the material contribute to its potential application. Pure hue is a valuable trait in colorimetric sensors. And unlike pigment-based paints or dyes, structural color won’t fade. Polydopamine, like melanin, absorbs UV light, so coatings made from polydopamine could protect materials as well. Dopamine is also a biological molecule used to transmit information in our brains, for example, and therefore biodegradable. “What has kept me fascinated for 15 years is the idea that one can generate colors across the rainbow through slight (nanometer scale) changes in structure,” said Shawkey whose interests range from the physical mechanisms that produce colors to how the structures grow in living organisms. “This idea of biomimicry can help solve practical problems but also enables us to test the mechanistic and developmental hypotheses we’ve proposed,” he said. Natural melanosomes found in bird feathers vary in size and particularly shape, forming rods and spheres that can be solid or hollow. The next step is to vary the shapes of nanoparticles of polydopamine to mimic that variety to experimentally test how size and shape influence the particle’s interactions with light, and therefore the color of the material. Ultimately, the team hopes to generate a palette of biocompatible, structural color.